Have you ever thought about the difference between traditional instruction in a brick-and-mortar school versus eLearning for students who take courses online? While eLearning is convenient and easily fits into students’ live, it also lacks the in-person dynamic which lets engaging students in course content and while also having easy access to their instructors. Fortunately, there is a solution that allows eLearning instructors to actively teach their students in real time while also enjoying the accessibility of online learning: Live Lecture enables you to engage remotely with your students in a high-quality online learning experience. Instructors are able to do everything a student is, in addition, to mute/unmute students, lock down students (i.e. restrict them from access to private chat), and assign anyone (including students) the role of Presenter. Presenters control the presentation area, allowing them to upload slides, annotate the current slide with whiteboard controls, enable/disable multi-user whiteboard, start a poll or share their screen for everyone to see. Note: an Instructor or Student can only be made a Presenter by an Instructor. 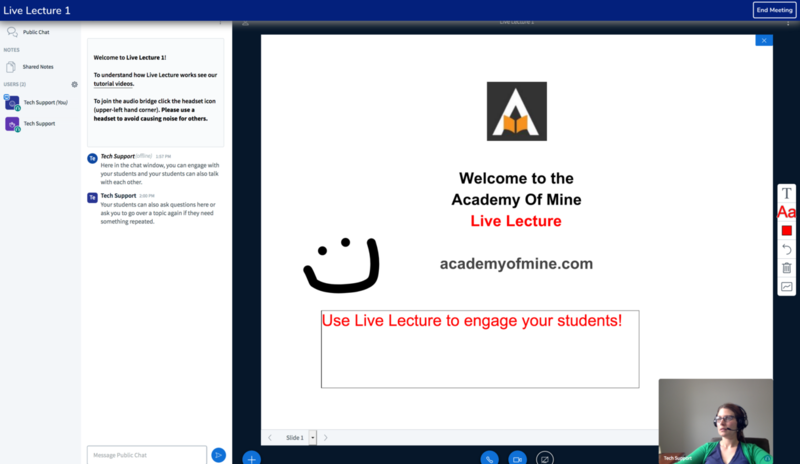 Live Lecture lets you simultaneously video conference, screen share, chat and show students course notes. Want to see other eLearning Platform features we have in addition to Live Lecture?